I styled the bun with hanging ropes on my sister who has blond hair to waist...it looked fantastic! Does anyone else have any ideas on some nice updos? 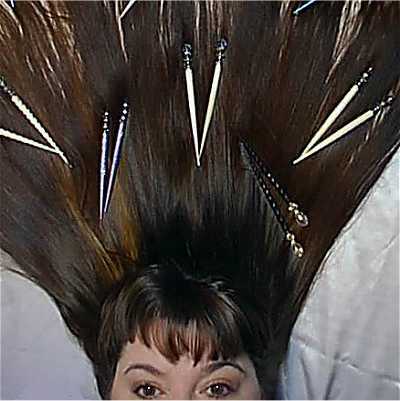 If I do my own hair for the prom, how can I ensure that it doesn't fall down? When I do the bun with hanging braids I keep the braids up with bobby pins, but after a while they fall out, what else can I keep them up with that will hold more securely? Yay! The bun took 5 minutes to do and it lasted 7 and a half hours! I usually need to take a hairbrush and a scrunchie to school, if the style doesn't fall off (which it always does! ), my hair gets frizzy or messy looking. But today it was fine all day long! And it's also relatively clean, I washed it yesterday. I'm so happy that my wavy hair holds updos well! One updo I have always liked for formal events is a knotted bun with hairsticks.I brush my hair back like I would for a HIGH ponytail,then make a knot close to my head and secure it with one or two hairsticks(like a normal bun)The length of hair is allowed to hang down freely,I think this always looks quite elegant. I'd like to try a knotted bun. My hair is only mid back at the moment but once it's longer I will try it . It's easy to curl my hair, I just braid it while it's damp (will work on anyone with wavy hair), and I think it would look nice with the curls hanging down. Think a knotted bun with hair that is long enough to hang down in a ponytail after knotting must look simply gorgeous. Pull your hair into a ponytail at the desired place on your head. 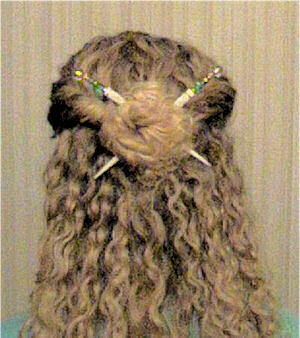 Take about 1/3 of your hair and coil it around the other 2/3 to make a "bun" around the rest of your ponytail. Secure the bun with hairsticks and if necessary bobby pins or my personal favorite for tough buns - a hair screw (though I haven't found them anywhere in a long time). And voila - it looks like you knotted your ponytail and you still have plenty of hair left hanging for the effect! I can't wait to get home and try both of these! !